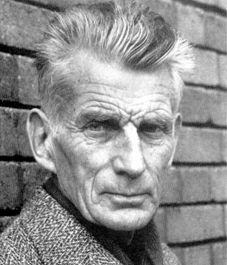 Playwright, poet, and novelist Samuel Beckett was introverted and unhappy in childhood and adolescence, pessimistic and fatalistic in his prose. His best known work, originally dismissed by some critics as a strange play in which nothing happens, was Waiting for Godot, wherein two characters wait for a third, who never arrives. He frequently wrote of dark events, stark fear, lack of identity, purposelessness, and death, yet he had an ability to occasionally pierce the bleakness and make such topics suddenly comedic. As a young man he studied at Trinity College Dublin, and worked as secretary to James Joyce, who became his mentor. His adopted home was France, where he settled in 1937, and he said that he preferred "France in war to Ireland in peace." He worked with the French Underground during the World War II occupation by Germany, first as a courier in Paris and later with the Maquis sabotage of the German army in the Vaucluse mountains. For his service he was awarded the Croix de Guerre and French Médaille de la Résistance. Though English was his native language, all of his major works were originally written in French. He said he was appalled to win the Nobel Prize for Literature in 1969, fearing it would make him a celebrity everywhere he went, and he sent a friend to Stockholm to accept the honor on his behalf. He spent more than fifty years with his lover, Suzanne Dechevaux-Dumesnil, and died just months after her death in 1989. ESTRAGON: Ah! (Long pause.) He didn't come?